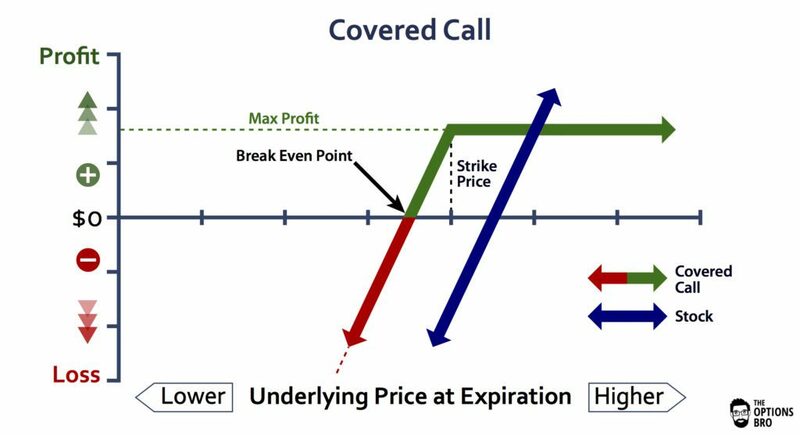 The long call option strategy is a bullish options trading strategy with a theoretical unlimited profit and a limited loss. Buying call options creates a long position on an underlying asset and limits net downside exposure. Out of every online broker with 24/7 customer service in 2018, Ally Invest the has the lowest commissions to trade the long call strategy as well as the best free options trading software. Read the Ally Invest Review. Note: like most options strategies, calls can be purchased in-the-money (ITM), at-the-money (ATM), or out-of-the-money (OTM). Pro tip: The market for deep ITM calls (and puts) is often terrible. Even on the most liquid assets, bid/ask spreads for ITM options can be huge. Because of this, traders often avoid buying deep ITM call options. Instead, they use slightly ITM, ATM, or OTM options to create long positions for a fraction of the necessary buying power of buying the underlying asset. Most commonly, traders buy OTM call options to speculate that the underlying asset will rise. Stock XYZ is trading at $50 a share. 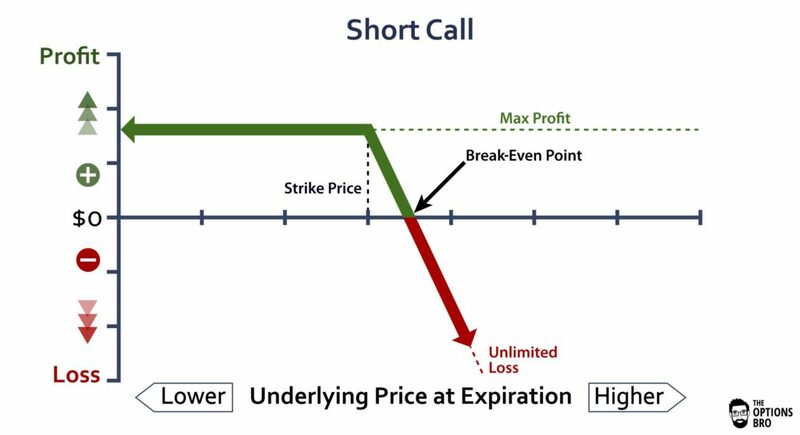 In the example above, the max loss is $30 (1 long call x $0.30 = $30). 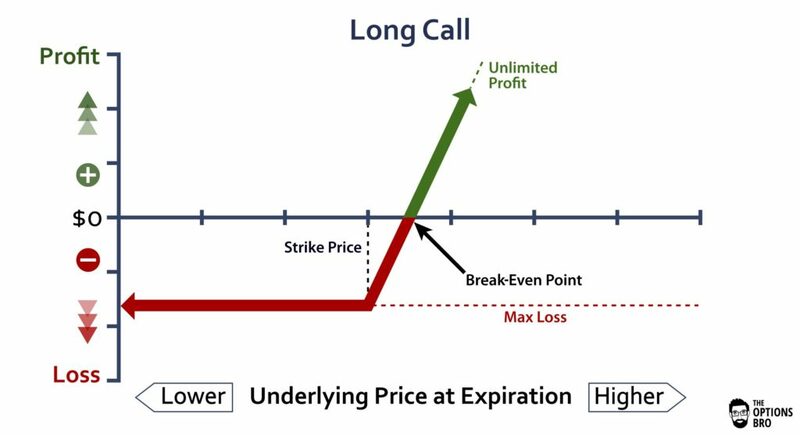 Long calls offer an inherently favorable profit/loss ratio. So what’s the catch? Well, in exchange for low potential loss and high potential reward, long calls that are not in-the-money at expiration will expire completely worthless. Therefore, long calls that are far out-of-the-money have a higher probability of expiring worthless. In order for a long call to be valuable at expiration, it must be in-the-money. In the example above, stock XYZ has to settle at or above $52.30 per share at expiration in order to break even on the trade. If it is anything less than that at expiration, the long call will be a losing trade. Volatility increases and rallies in the underlying asset at anytime before expiration will cause long calls to rise in value, often exponentially, because options offer a lot of leverage. However, most traders buy calls to speculate by using increased leverage with a minimal downside. The idea is that a trader will purchase a call option for $0.30 and sell it prior to expiration for a profit. Of course, not only is timing is critical with this strategy, but the amount the underlying asset moves is also paramount. In the aforementioned example, if stock XYZ hardly budges, the long call will lose value day-by-day unless there is a large expansion in volatility. Generally, volatility increases occur with downward movements in the underlying. The reality, however, is volatility can expand at any time without any movement in the underlying. The long call option strategy presents an appealing way to gain long exposure in an asset for a fraction of the price of actually buying the asset itself. Plus, as an added bonus, the maximum loss is always limited and typically less than buying the underlying asset outright. What this means is, if a trader wants to purchase 100 shares of stock XYZ at $50 a share, it would cost $5,000 in buying power without trading on margin. With portfolio, intraday, or regular margin, the trader could purchase substantially more shares and reduce the buying power requirement, but the trader will be charged margin interest for holding the position. This is one of the main reasons why traders favor the long call option strategy. By purchasing two at-the-money calls with a delta of 0.50, you could create the same long position (with the same delta exposure) as purchasing 100 shares of stock. Using call options to create a long position frees up a lot of capital. Plus, the risk/reward is better due to the limited downside (premium paid) and unlimited upside. This is because all options use leverage, and there is a significant risk that the options can expire worthless. Moreover, the further out-of-the-money the calls are, the cheaper they are, so there is inherently more leverage. What about Theta (Time) Decay? Theta decay for a long call is highly unfavorable. Everyday, premium will be systematically priced out of call options. As expiration nears, out-of-the-money and at-the-money calls will lose their value faster than in-the-money calls due to theta decay. When Should I close out a Long Call? A lot of traders who buy calls aim to close the calls out for a profit before expiration. Because the profit for a long call is unlimited, there is no “set” time to close the position. The underlying asset could theoretically keep climbing, but this realistically doesn’t happen that often…or at all. For a losing long call position, if the value of the long call approaches zero, there is no benefit to closing it. This is because the max loss has already been reached and it will either stay there or increase in value. Note: The only stock that writers at The Options Bro have actually witnessed almost go to infinity in 10+ years of active trading, was KBIO, and it was not an optionable security, so we really were not interested. Due to someone purchasing a large portion of the available float, and then restricting short-selling of his purchased shares, KBIO sort of went to infinity…sort of. Read about it here. Anything I Should Know about Expiration? Yes, but it depends on the underlying asset settlement. If the asset settles in cash, there is nothing you have to worry about. Stock indices like SPX are cash settled and are very popular with call buyers. However, for individual stocks and some futures, if you are long ITM calls, you need to be able to have enough cash in your account to buy 100 shares or 1 futures contract at the strike price of the call for every long option contract. If you are long 10 $52 calls, you need to have $52,000 to purchase 1000 shares of stock. Of course, a typical margin account can bring this requirement down significantly. This is the biggest expiration risk for call buyers, but it is easily avoidable by closing out long ITM calls prior to expiration. Call buyers always have the right, but not the obligation, to buy the underlying asset. However, if an ITM long option position is left unattended at expiration, it will have to eventually be exercised by the clearing corporation. Your options broker will likely reach out if you have a long option position that’s ITM at expiration if the exercise of that position will cause a negative margin impact. If a long call expires out of the money, the position will fall off from your trading account and it will be a complete loss. There is no need to take action in that situation. Regardless, all expiration risk for the long call option strategy can be easily avoided by actively monitoring your account on expiration day; it’s best not to rely on your broker to notify you. 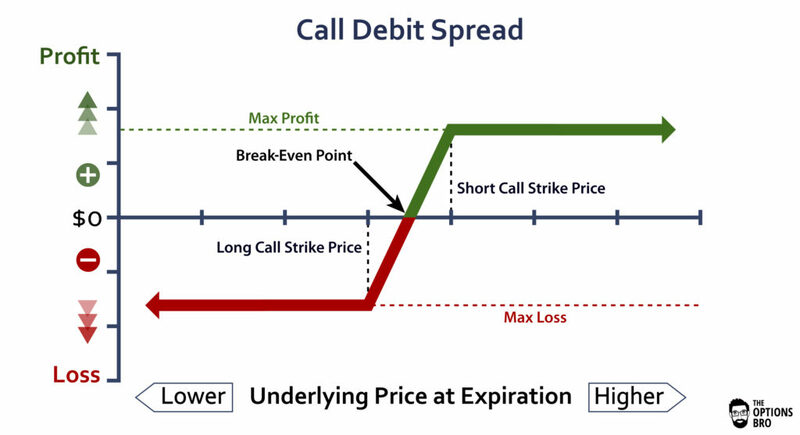 Buying call options is a straightforward options strategy to go long with a limited downside and an unlimited upside. It is this very nature of an unlimited profit, limited downside, and lots of leverage that makes the long call option strategy so interesting. The most important thing to remember when buying call options is to size the position appropriately. There is always a chance that the total amount of money spent on the long calls will be wiped out due to the call options expiring worthless. Therefore, buying call options is a risky strategy. Not as much capital should be committed to long options positions, particularly those that are OTM, than long equity positions. Ally Invest is the cheapest broker to buy call options. Up to $3,500 cash bonus + commission free trades for new accounts.